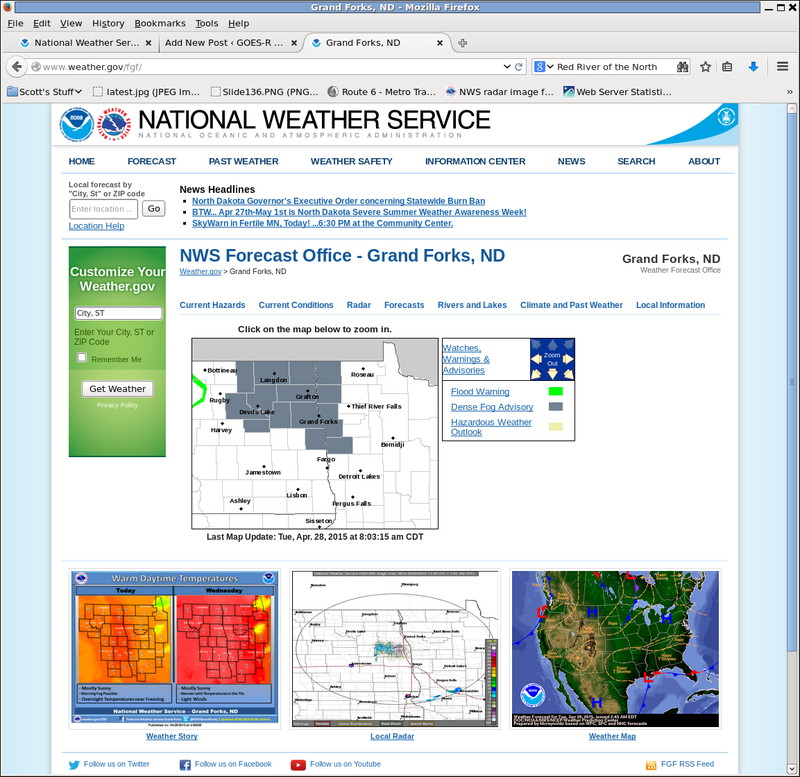 Dense fog developed over the High Plains of Kansas and Nebraska overnight on 4-5 August 2015, and Advisories were issued by the North Platte, NE, Goodland KS and Dodge City KS WFOs. The animation above, of GOES-R IFR Probability fields computed from GOES-13 data, shows a slow expansion in the area of highest probabilities. The IFR Probability field has less spatial variability over eastern Kansas and eastern Nebraska where strong convection prevented the satellite from detecting low clouds; there, only model data predictors (from model fields that vary smoothly) could be used in the computation of the GOES-R IFR Probability fields and the IFR Probability field therefore has a smoother look. 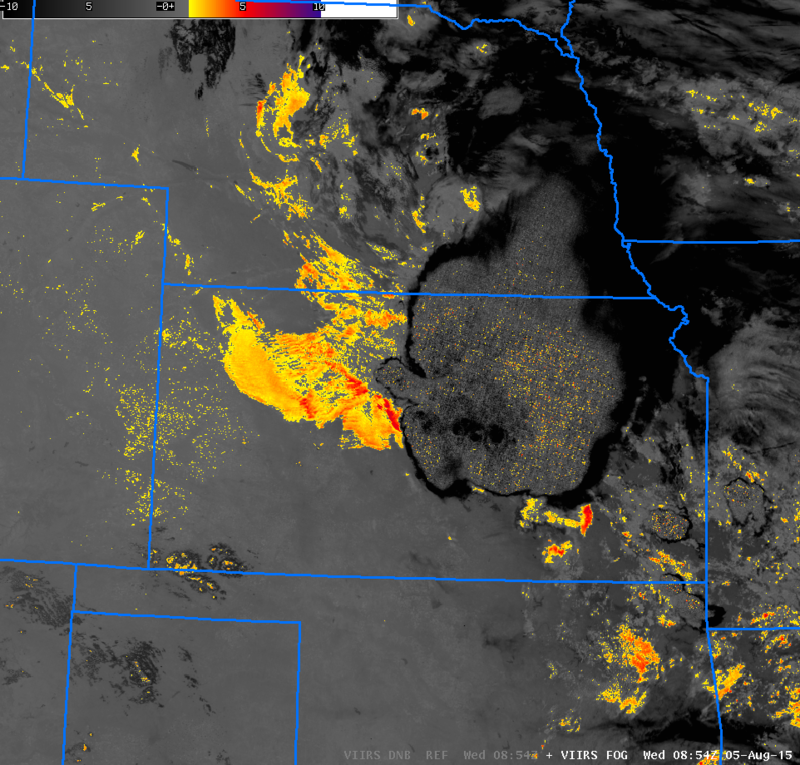 Suomi NPP overflew Kansas around 0800 UTC on 5 August, and the Day Night Band imagery, below, showed both the strong convection (complete with streaks associated with lightning) and the developing low clouds. Brightness Temperature Difference (11.45 µm – 3.74 µm) fields from Suomi NPP (Link) confirm the presence of water-based clouds (yellow and orange in the enhancement used). 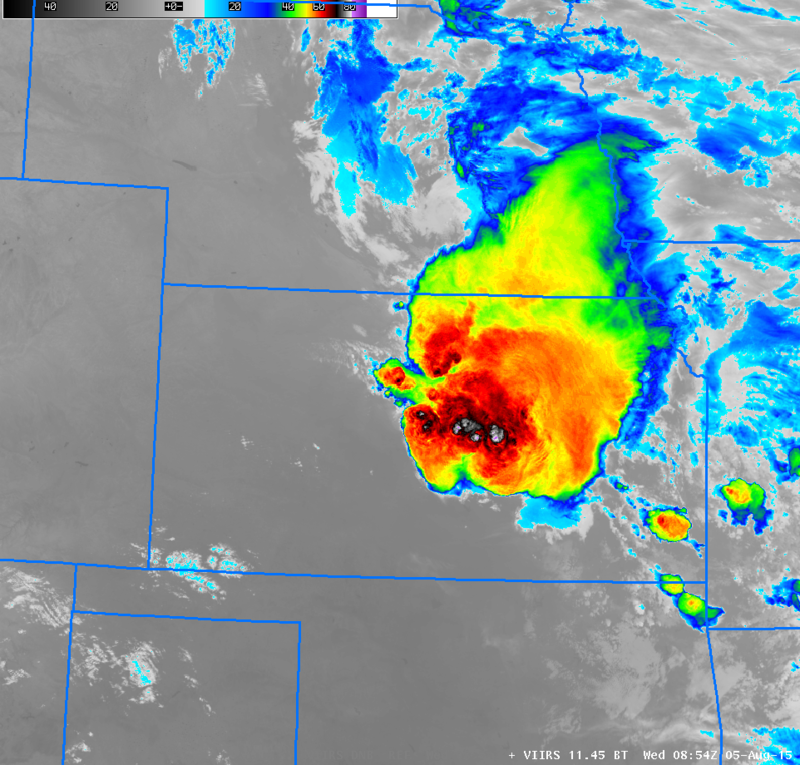 The strong convection over eastern Kansas has multiple overshooting tops still at 0854 UTC (Link). This entry was posted in Day/Night Band, Plains on August 5, 2015 by Scott Lindstrom. GOES-R IFR Probability Fields showed large values at sunset over the Atlantic Ocean east of New Jersey and the Delmarva Peninsula. As night progressed, that fog penetrated inland. The IFR Probability field accurately depicts the region where visibilities due to fog were reduced. The 0400 UTC image in the animation above (reproduced below), has qualities that highlight the benefit of a fused product. The Ocean to the east of the southern Delmarva peninsula is overlain with multiple cloud layers that make satellite detection of low clouds/fog problematic. In this region, satellite data cannot be used as a predictor and the GOES-R IFR Probability field is a flat field. Because the GOES-R IFR Probability product includes information from the Rapid Refresh model (2-3 hour model forecasts, typically) and because saturation is indicated in the lowest 1000 feet of the model, IFR Probabilities over the ocean are high in a region where satellite data cannot be used as a predictor. GOES-R IFR Probabilities can also be computed using MODIS data, which data has better spatial resolution than GOES (1-km vs. nominal 4-km). 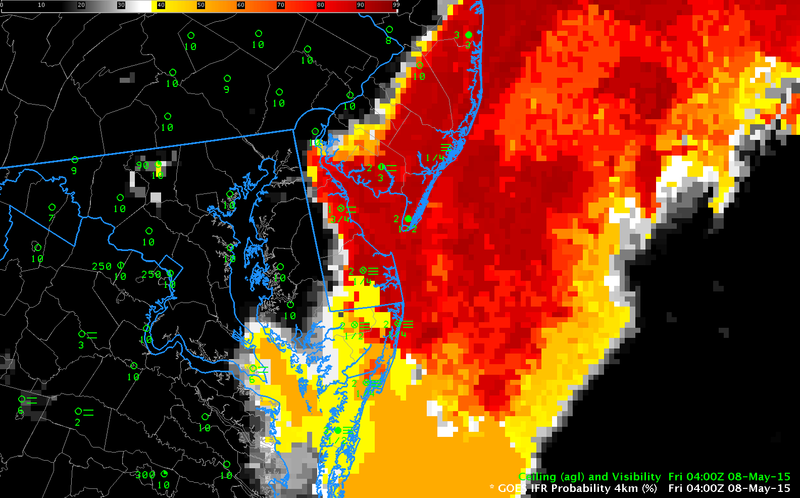 The toggle below of the MODIS brightness temperature difference and the GOES-R IFR Probability shows a very sharp edge to the expanding fog field over New Jersey. The Gulf Stream is apparent in the Brightness Temperature Difference field above and IFR Probabilities are high over the ocean between the coast and the Gulf Stream. In the absence of observations, how much should those high IFR Probabilities be believed. There is high dewpoint air (mid-50s Fahrenheit) along the East Coast at this time, and advection fog could be occurring, for example. Suomi NPP also overflew the region shortly after midnight. The toggle below, of brightness temperature difference and the Day Night Band confirms the presence of (presumably) low clouds over the cold Shelf Water of the mid-Atlantic bight. This entry was posted in Day/Night Band, Mid-Atlantic, MODIS, Suomi/NPP on May 8, 2015 by Scott Lindstrom. Dense Fog developed over the Hastings, Nebraska WFO overnight, leading to the issuance of Dense Fog Advisories. The GOES-R IFR Probabilities, above, show a steady increase in probabilities over the night as the fog develops. The relatively flat nature of the IFR Probability field is characteristic of GOES-R IFR Probabilities that do not include information from satellite (that is, only model fields are being used here to educe IFR probabilities). IFR Probability fields are a fused product, typically blending information from model fields and from satellite data. However, this was a case of fog developing under an extensive cirrus shield so that satellite data were not used as a predictors. The 10.7µm – 3.9µm Brightness Temperature Difference field, shown below, gives no information about surface conditions. That the IFR Probability fields neatly overlap the region of developing IFR conditions is testimony to the accuracy of the model field in simulating the lower part of the troposphere. When only model data are used, as above, features in the field that are parallel to surface topography contours can become evident in the GOES-R IFR Probability fields. This is related to interpolation of the lowest 1000 feet of model relative humidity fields (moisture information that is used as a predictor in the computation of the IFR Probability) in regions of sloping topography. In the animation above, note that the IFR Probabilities increase in the final frame. Over most of the scene, at 1215 UTC, the sun has risen and Daytime Predictors are being used to compute IFR Probabilities. (The dividing line between Daytime — to the east — and nighttime — to the west — is visible stretching north-northwest to south-southeast from the extreme northeast corner of Colorado). IFR Probabilities are somewhat higher during the day (compared to night) because visible imagery is incorporated into the satellite predictors; more accurate cloud clearing means that IFR Probabilities increase just a bit. Suomi NPP overflew Nebraska, giving a view of the extensive cirrus shield. The Day Night Band gave crisp imagery as the Moon was very nearly full. This entry was posted in Day/Night Band, Multiple Cloud Layers, Plains on May 5, 2015 by Scott Lindstrom. Dense Fog advisories were issued by the National Weather Service in Grand Forks as visibilities in the WFO dropped to near zero. How did the IFR Probability Fields and traditional Brightness Temperature Difference Fields capture this event? 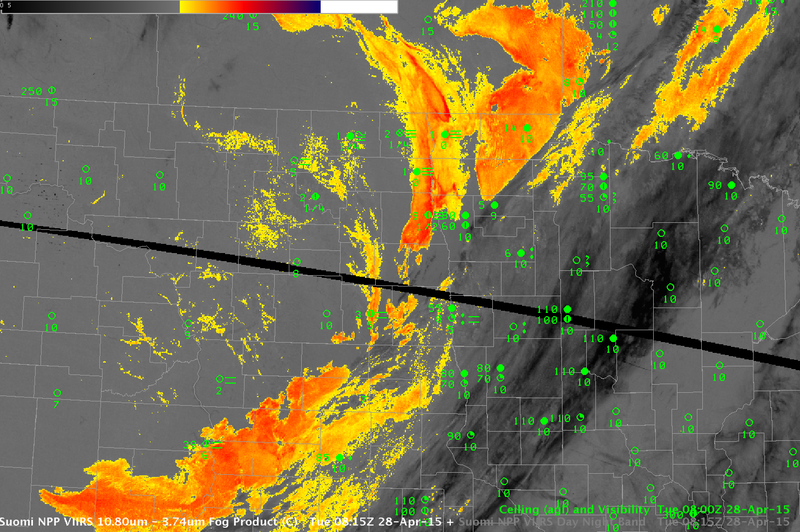 The animation below shows the brightness temperature difference field (10.7 µm – 3.9 µm) from GOES-13. Initially, a swath of mid-level and upper-level clouds covered the Red River Valley (this system had produced very light rains on Monday the 27th), but the clouds moved east and dense fog quickly developed (Cavalier, ND, for example, showed reduced visibility already at 0400 UTC). The IFR Probability fields for the same time, below, better capture the horizontal extent of the fog. For example, the strong signal in the Brightness Temperature Difference field over South Dakota at the end of the animation, above, is not present in the IFR Probability fields. 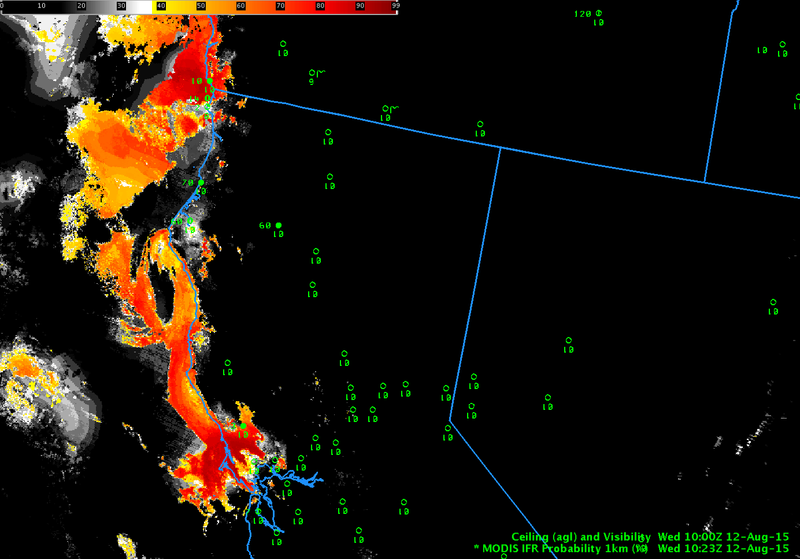 IFR Conditions are not occurring over South Dakota. The good match between the developing IFR Probability fields and the developing fog testifies to the satellite view of the fog and the accurate simulation of this event by the Rapid Refresh model. Geostationary GOES fields give good temporal resolution to the evolving field. Polar orbiting satellites, such as Suomi NPP (carrying the VIIRS instrument) and Terra/Aqua (each carrying MODIS) each gave snapshot views of the developing fog. 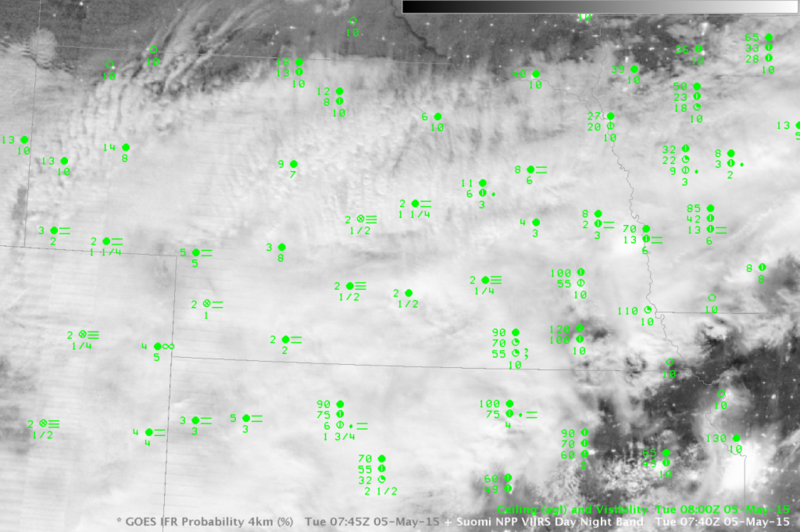 At 0355, IFR Probabilities are low, and the Red River valley is mostly obscured by higher clouds. 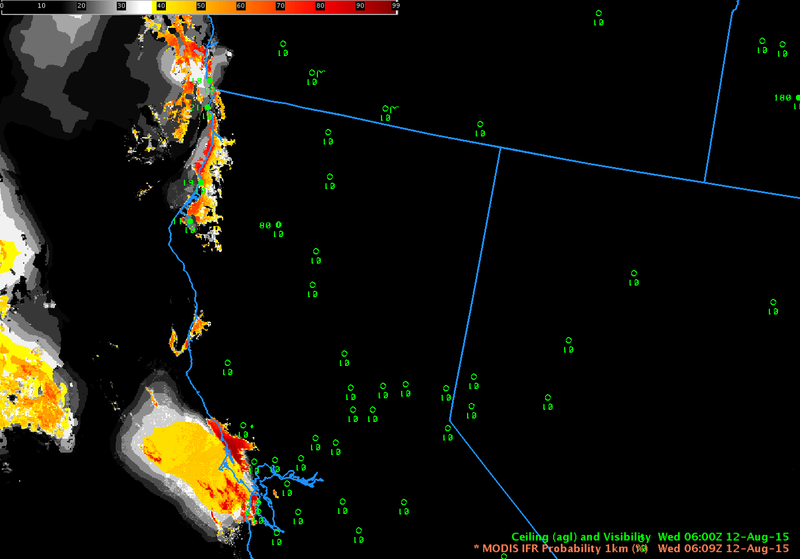 Four hours later, at 0805 UTC, dense fog has developed and IFR probabilities are large. Suomi NPP also viewed the fog field. The toggle between the Day Night Band and the Brightness Temperature Difference field (11.45µm – 3.74µm), below, shows evidence of fog in the visible Day Night band imagery. The lights of western North Dakota’s oil shale fields are also evident. Polar-orbiting satellites give excellent high-resolution imagery of fog fields. When used in concert with the excellent time resolution of GOES imagery, a complete picture of the evolving fog field can be drawn. This entry was posted in Day/Night Band, MODIS, Northern Plains, Suomi/NPP on April 28, 2015 by Scott Lindstrom. Brightness Temperature Difference Fields (10.7µm – 3.9µm) and surface observations of ceilings and visibilities, Hourly from 0200 through ~1400 UTC [Click to enlarge]. Traditional method of fog/low stratus detection revealed a sharp edge to clouds over east Texas during the morning of 29 December 2014. The animation above reveals several difficulties inherent in using brightness temperature difference fields in diagnosing fog/low stratus. Where multiple cloud layers are present — such as along the coast at 0500-0600 UTC — the brightness temperature difference product cannot view the low clouds. At sunrise, increasing amounts of solar 3.9µm radiation causes the brightness temperature difference product to flip sign. The signal for low clouds is still there, however. The animation of GOES-R IFR Probabilities, above, created from GOES-13 data and Rapid Refresh Model data, shows high IFR Probabilities over east Texas where low ceilings and reduced visibilities prevailed, including metropolitan Houston. The algorithm suggests the likelihood of fog/low stratus underneath the cirrus debris that is over the coast around 0500-0600 UTC as well, because the Rapid Refresh model output in that region strongly suggests low-level saturation. In addition, the fields show only minor changes through sunrise (the effect of the terminator is present in the final image in the loop). MODIS data from either Terra or Aqua can be used to produce IFR Probabilities. The data below is from 0442 UTC. Polar orbiter data is infrequent, however, so temporal monitoring of the fog/low clouds is more easily achieved using GOES data. MODIS data, like the GOES data above, shows the effects of cirrus clouds on Brightness Temperature Difference fields and on IFR Probabilities. Cloud predictors of low clouds/fog from satellite cannot be used in regions of cirrus, so IFR Probabilities are smaller in regions where multiple cloud layers exist, which regions are where only Rapid Refresh Data can be used as predictors. Brightness Temperature Difference fields can also be created from Suomi/NPP data and the orbital geometry on 29 December meant that eastern Texas was viewed on two sequential overpasses. IFR Probabilities are not quite yet computed using Suomi NPP data, but the brightness temperature difference fields can be used to show where water-based clouds exist. They show a very sharp western edge to the clouds. 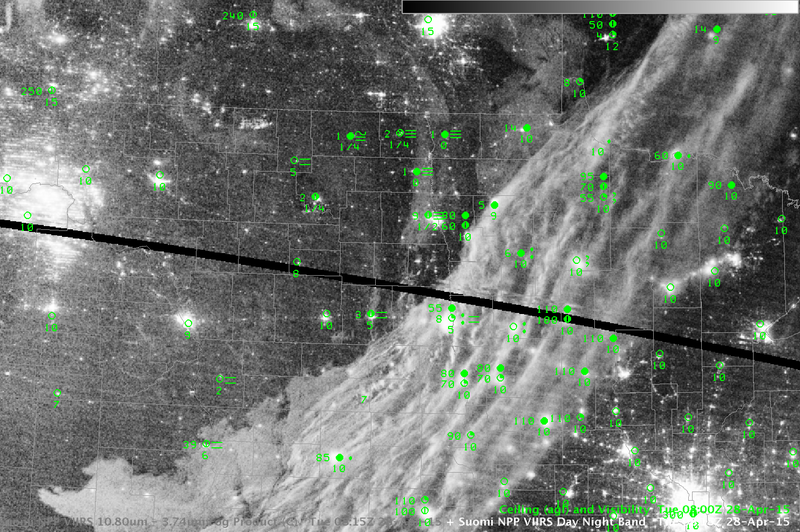 The Day Night Band on Suomi NPP produces visible imagery at night. When lunar illumination is strong, it can provide compelling imagery. On 29 December 2014, however, the moon set around 0600 UTC, so no lunar illumination was available, and fog/low clouds are very difficult to discern in the toggle below between the Day Night Band and the brightness temperature difference field at 0723 UTC. This entry was posted in Day/Night Band, Deep South, MODIS, Multiple Cloud Layers, Suomi/NPP, Texas on December 29, 2014 by Scott Lindstrom. Fog developed over Texas, Oklahoma and Arkansas early in the morning of 9 December 2014. Multiple cloud layers made traditional satellite detection (that is, using brightness temperature difference field (10.7µm – 3.9µm)) problematic. How did the fused product, GOES-R IFR Probability perform? The animation below shows the hourly evolution of IFR Probability from 0215 UTC through 1415 UTC. There are widespread reports of IFR conditions over southeast Oklahoma and northern Texas, as well as over Arkansas in the Arkansas River Valley. IFR Probability fields generally overlap the region of reduced ceilings and visibilities. Note that the probabilities increased over west Texas between 1315 and 1415 UTC. The boundary between day and night predictors is also apparent at 1415 UTC as a SW to NE line over the Texas Panhandle. Probabilities change as night switches to day because different combinations of satellite predictors can be used. In particular, the use of visible imagery improves cloud clearing and therefore IFR Probabilities increase in regions where low clouds exist (because the possibility of clouds being present is more easily detected). The toggles below show data from 0615, 1115 and 1415 UTC and demonstrate why a fused product can give better information than a satellite-only product. Intermittent high clouds over the southern Plains prevented GOES-13 from identifying regions of low clouds (Cirrus clouds in the enhancement below appear as dark regions). IFR Probabilities can give valid information in these regions because the Rapid Refresh Model gives information about the possibility of low-level saturation. There are large regions at 1415 UTC over west Texas that are covered by cirrus clouds; despite the inability of the satellite to detect low clouds, IFR Probability maintains a strong signal there where IFR Conditions are occurring. The 1415 Brightness Temperature Difference field, in contrast to the IFR Probability field, gives very little information because increasing amounts of solar radiation are changing the relationship between 10.7µm and 3.9µm radiation at 1415 UTC. 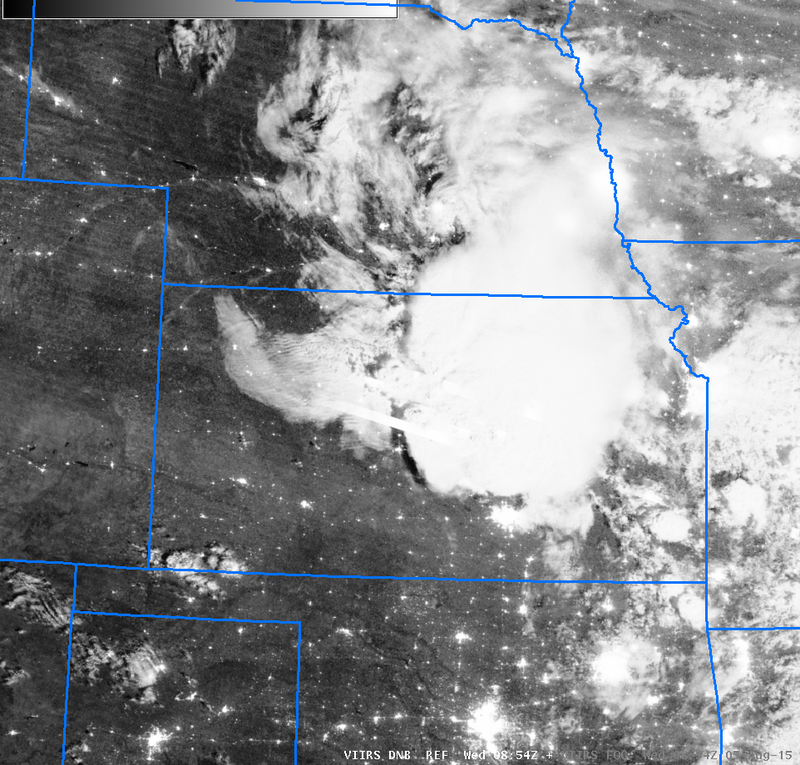 A near-Full Moon on 9 December means that the Day Night Visible imagery from Suomi NPP produced great imagery of the clouds over the southern Plains. The toggle below shows the Day Night band, the brightness temperaure difference field (11.35µm – 3.74µm) and the topography. Very narrow fog banks are apparent over southeast Oklahoma and over Arkansas, nestled into narrow valleys. The Brightness Temperature Difference field distinguishes between water-based clouds (presumably low stratus or fog) in orange and ice clouds (cirrus) in black. The fog event over Dallas was photographed from the air: Link. This entry was posted in Day/Night Band, Multiple Cloud Layers, Plains, Suomi/NPP on December 9, 2014 by Scott Lindstrom.